Buying organically grown food—free of harmful chemicals, bursting with more nutrition, taste, and sustainable sustenance—is a direct vote for immediate health and general good feelings. Finding stores in your ‘hood that sell fresh, organic produce can prove to be quite difficult. So, we’ve put together this little list for you to achieve your conscious living goals right here in Whitefield. 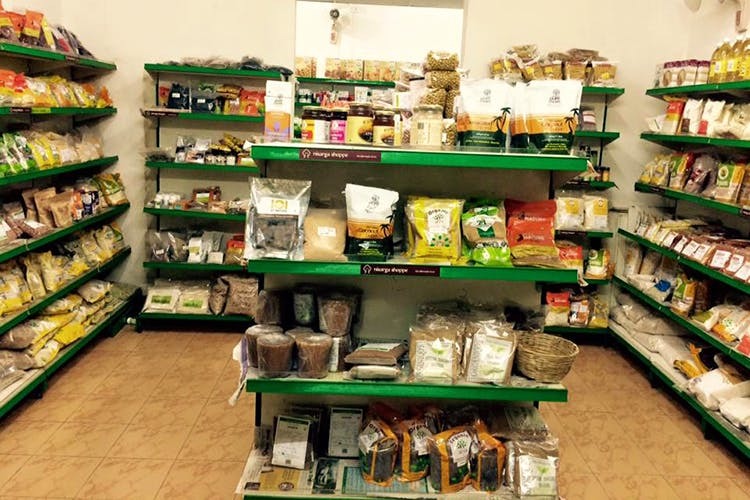 One of the most popular organic stores in Bangalore, Lumiere is also one of the oldest players in the market, and they have the patrons to prove it. They have healthy and natural alternatives for all your household needs like toiletries, cosmetics and all kinds of food. But it’s their bakery that really takes the cake, with different kinds of bread such as whole-wheat, multi-grain, and even garlic and shallot, along with cakes, cookies and muffins. Opened in August 2010, Nisarga Shoppe offers a range of healthier food products that aren’t readily available at a local supermarket. That’s probably also why they call themselves an “Alternate Store”. They have everything you need to start your green journey— varieties of unpolished rice, pickles, jams, handmade cheese, and breads to natural sweeteners like jaggery, honey, fresh produce such as vegetables and also personal care products. We hear their Olive Neem Shampoo is a must-try. Happi Organic is another one-stop shop for all your organic home-grown needs. They stock up on brands like Aloe Veda, Organic Lifestyle, Ancient Living, 24 Mantra and Phalada Pure & Sure. Apart from food, condiments and beverages, you can also check out their wide range of haircare, skincare and bath products. But we go there for the chaklis and kodbales from Pure & Sure Organics. Founded by two friends, Gautham and Anurag, who quit their corporate lives, Healthy Buddha enables everyone to have access to good quality organic produce at affordable prices. They don’t have a physical store but they do deliver in and around Whitefield. Add to your shopping cart their unprocessed milk sourced from Indian breed cows that are raised on farms and not dairies, as well as fresh veggies and breads. Delivers in Whitefield, Indiranagar and Old Airport Road. Okay, this isn’t exclusively Whitefield but they are based out of Whitefield. Mostly stocking run-of-the-mill kitchen produce, they apparently have organic alternatives to all the grains and cereals we use in our everyday Indian cooking, like green gram, rajma, dal, jowar and lots more. You can get their packeted produce in many regular grocery stores like More and HyperCity.